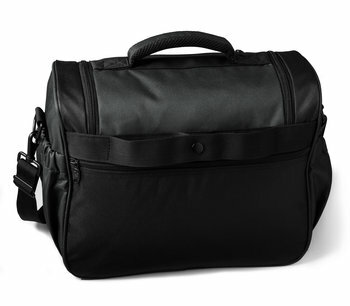 Fly Happy: Here's the perfect under-the-seat bag for everything you want within easy reach during your flight. You'll be amazed by how much our Euro Flight Bag holds — and it folds nearly flat when empty, making it a versatile shopping/picnic bag as well. Pockets Galore: Its generous main compartment zips open extra-wide (11" x 12") for easy access. 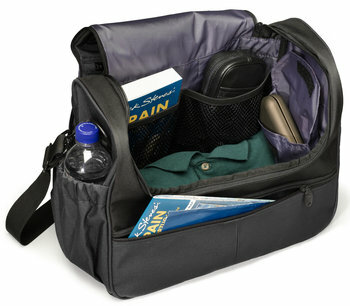 The inside features two mesh pockets plus two side pockets (one removable). Outside you'll find three additional zippered pockets plus a handy book/beverage pocket on each side. 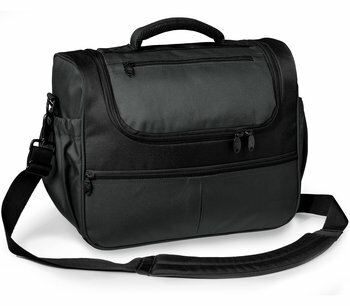 Handy Features: Our Euro Flight Bag also comes with a curved and padded shoulder strap, padded grab handle, and internal O-ring to clip in a document pouch. Plus, its back panel slides and snaps securely over any rolling bag handle, so you can stack 'em and roll 'em together! Parental Bonus: This is also the classiest-looking, most functional diaper/toy/snack/book bag you’ll ever travel with…across the Atlantic or across town. Colors: Available in black, graphite, blue spruce, plum, and camel. Dimensions: 14" x 12" x 7"